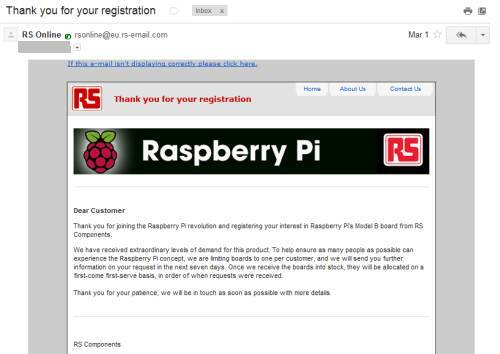 NOTE: This post is very old and details the process for ordering the original Raspberry Pi back in 2012. 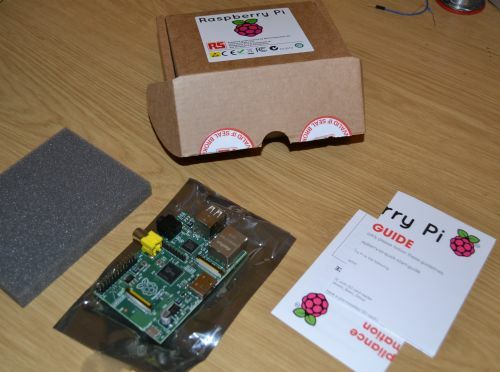 It is now much easier to order a RPI, available from many online stores, such as this one. I’ve had a few people ask me how I ordered my Raspberry Pi and how long it took for me to get it. So here is the process I followed, including a time line. 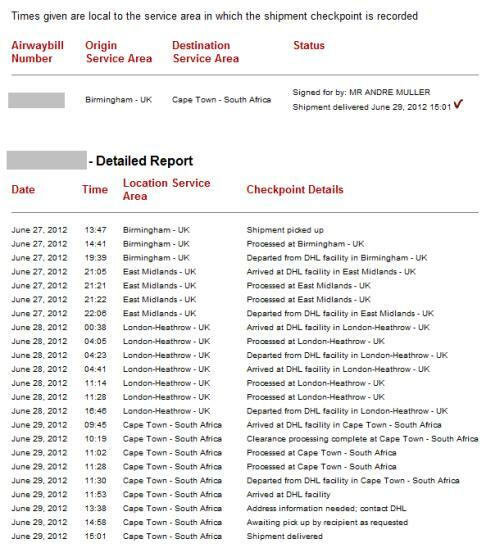 I live in Cape Town, South Africa and the whole process took about 4 months from registration to delivery. I received an update from RS Components that they’ve had a ‘manufacturing hiccup’ but not to worry, and that invitation will still be sent out on a first-come, first served basis based on when I registered. 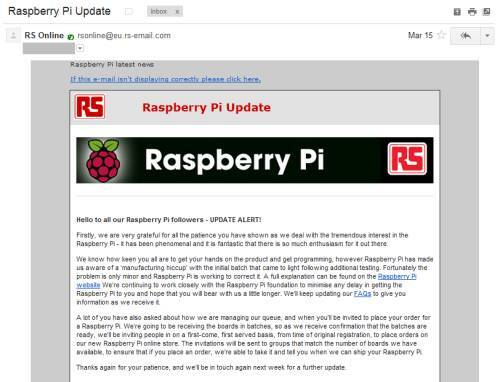 I receive another update from RS Components. 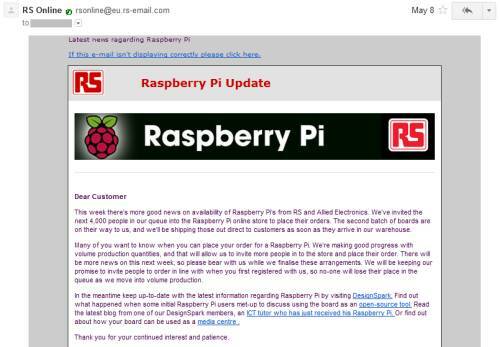 They say that they’ve invited the next 4000 people in the queue to order their Raspberry Pi’s and that the second batch of boards are on their way. I get an email from RS Components saying I can now place my order. 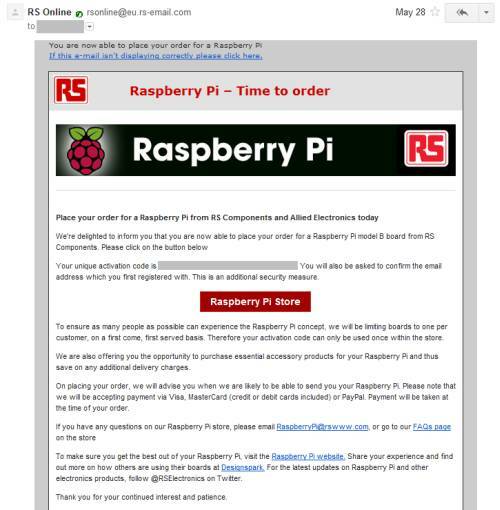 This takes me to a webpage where I can enter my activation code included in the email and allows me to order the Raspberry Pi and pay for it. I receive an email from DHL indicating that my order has shipped with DHL Express, including a tracking number and tracking URL for my package. Finally, my Raspberry Pi arrives! Update (2012-07-17) : The one per customer limit has been raised, and you can now order as many as you like from this website: http://authenticate.rsdelivers.com/ when I had a look today the wait time was 11 weeks for delivery. i ordered mine on the 18 of June and to date have not received any info from DHL with a waybill number. i have my order ref number and rs stock number, its been 6 weeks to date and still no Pi. 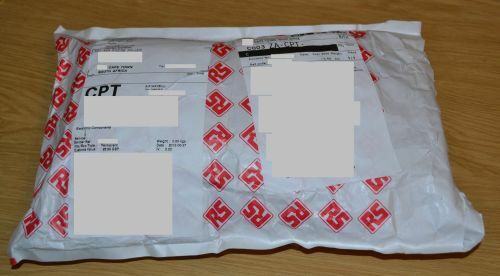 Do you know how else i could see where my Pi is called DHL and they can only assist with a waybill number RS computers cant help as well. 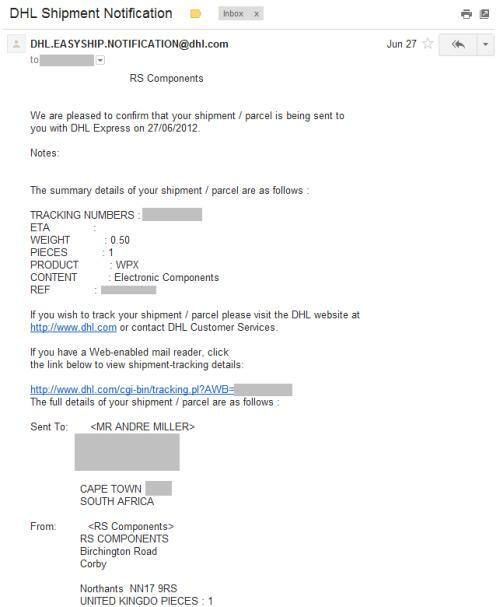 Did you order it from RS Components and have you paid for it already? If you have paid for it you should have received an email indicating when it will be dispatched. Based on recent a order I placed the estimated dispatch time indicated on the order was 11 weeks. Did yoy pay a customs duty? How much was the DHL shipping? I didn’t have to pay any customs duty. 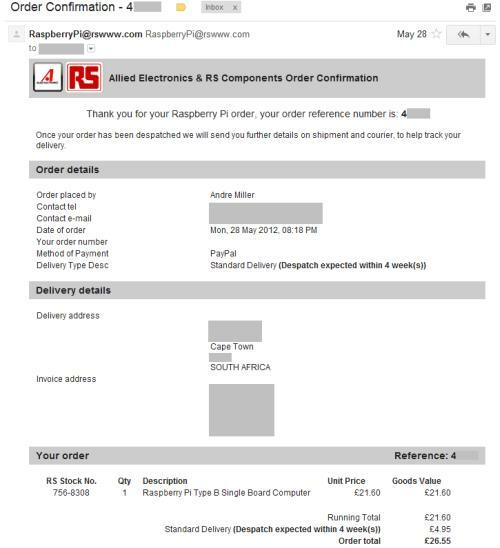 The Raspberry Pi was £21.60 and delivery was £4.95 for Standard Delivery, which ended up being delivered with DHL. So in total I paid £26.55, which included all costs.